Courtesy of WEEKLEY HOMES REALTY COMPANY. Under Construction. This Eclipse is the open floorplan you’ve been searching for. This traditional style, single story home welcomes you with beautiful oak wood looking tile flooring flowing through the foyer, kitchen, dining area, study, retreat, utility, and family room. The chef in the family will be delighted with the 5′ x 7′ granite topped island with espresso cabinets, with elegant white maple cabinets throughout the rest of the kitchen, and a stone backsplash. There’s even a big walk-in pantry. The owner’s suite features large bay windows for lots of natural light, plenty of room for a king size bed, plus a sitting area. The elegant master bath comes complete with a gentleman’s height double vanity and big walk-in supershower. Two secondary bedrooms are split by a retreat area and share a hall bath. You’ll love all the extra storage in this home too. 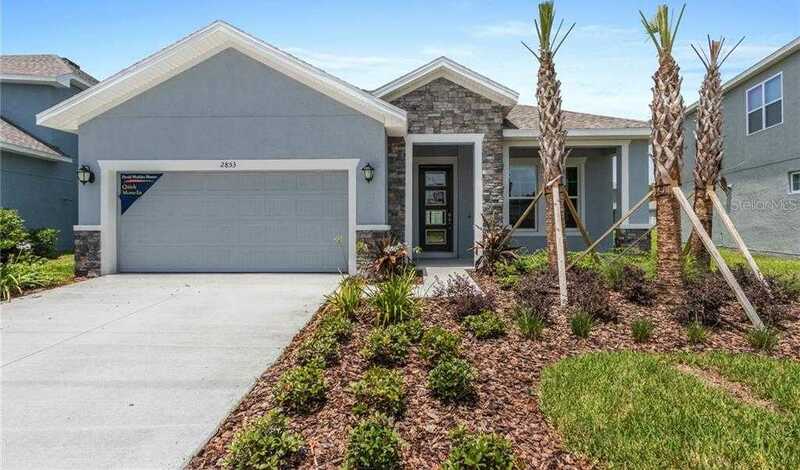 Come see this stunning David Weekley Home before it’s gone. Please, send me more information on this property: MLS# T3156650 – $399,597 – 2853 Posada Ln, Odessa, FL 33556. I would like to schedule a showing appointment for this property: MLS# T3156650 – $399,597 – 2853 Posada Ln, Odessa, FL 33556.